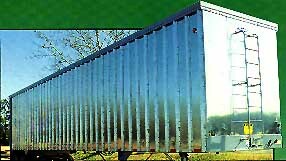 Heavy duty aluminum construction side posts, skin and live floor, the refuse transport trailer is designed to empty an entire load in 8 to 12 minutes. All 24 channels move 10 in. to the rear to unload, and every third channel sequentially retracts until all are in original position. They slide on polyethylene bearings located at each cross member and all across the wheel wells. I-beams on 12-in. centers provide support for capacity loads while keeping trailer weight at a minimum. Wet kits are available for the live floor transport. They include a PTO unit and a hydraulic pump to power the live floor drive when necessary.